NEW HAVEN - The co-op of Bolton, Coventry and Rockville entered Saturday's Division III final with plenty of hype surrounding its defense after nine shutouts this season. 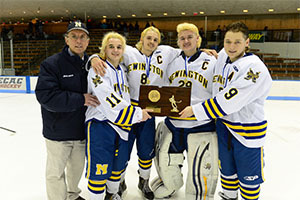 But once again, it was Newington/Berlin's defense that stole the show at Ingalls Rink in the Division III Final. 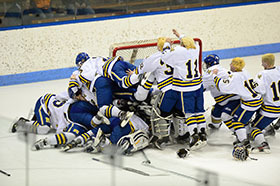 Led by another memorable performance from goalie Drew O'Leary in net and a second period goal from Marco DiPaola, the co-op of Newington/Berlin defeated Bolton/Coventry/Rockville 1-0 in the Division III championship for back-to-back titles. "Our motto all year has been to play real strong defense and it has gotten us this far," Newington/Berlin coach Dave Harackiewicz said. "I said to the boys before the game if we get that first goal we are going to hold it up." It was the second straight season Newington/Berlin (17-4-2) has put together an impressive defensive display in the biggest game of the season. Last March, Newington/Berlin stopped an equally dynamic offense in Northwest Catholic to claim its first state title. But on Saturday, the co-op, which added Manchester during the off-season, was even better. O'Leary made 16 saves and his defense did a great job of shutting down the Bolton/Coventry/Rockville offense, which was averaging 4.8 goals a game. "It was just a great team effort," O'Leary said. "We shown a lot of heart. I couldn't be happier to call these guys my brothers and say I went to battle with them today." After surviving a flurry of activity from Bolton/Coventry/Rockville (20-2-2) in the first six minutes, Newington/Berlin turned the tide. They played tighter on defense and made sure to limit quality chances on net. And then took the lead with 2:34 left in the second period when DiPaola scored off a low shot to the near post on a 4-on-4 opportunity. "I shot right where I wanted to shoot and it was a hard shot," DiPaola said. Bolton/Coventry/Rockville wouldn't get any closer. Newington/Berlin stopped BCR on three power plays and held it to just two shots in the second period. And the Indians only got better as the game went on. "I thought [Newington/Berlin] played a great game bottling us up and taking time and space away," BCR coach Chris Stevenson said. Still, BCR had its chances, including a power play opportunity with 5:36 left in the third period. But O'Leary and his defense was ready. They managed to get in the way of nearly every great chance and limit any shots from below the slot. BCR would eventually pull Cam Earle with nearly a minute left but it wouldn't be enough. It was the second shutout for Newington/Berlin against BCR this season. Three Manchester kids were part of the title for Newington/Berlin after playing with Rockville last season. Rockville joined with Bolton/Coventry/Lyman Memorial this offseason to save its program and then helped the Manchester kids find a team. CIAC Division III Finals Rockville timeout with 5:24 left in third period.